The teeth are the hardest of any animal’s body part. Sharks are among the animals in the world with the sharpest teeth. Beavers are known for their ability to cut down trees using only their teeth. Teeth are use in eating and in fighting. It is one of the essential weapons used by carnivores to capture their prey. Here are some animals with the most unusual teeth. An indication that a person didn’t brush his/her teeth is that the teeth tend to become yellow in color. The animal above called Nutria is not unique for having large teeth but it is peculiar for having “orange-colored teeth”, the only creature in the world with such teeth. Nutria is a unique, large, herbivorous and semi-aquatic rodent endemic to South America. It has since been introduced to Africa, Asia, Europe and North America. It is also commonly called Orange Nutria, Coypu and River Rat. 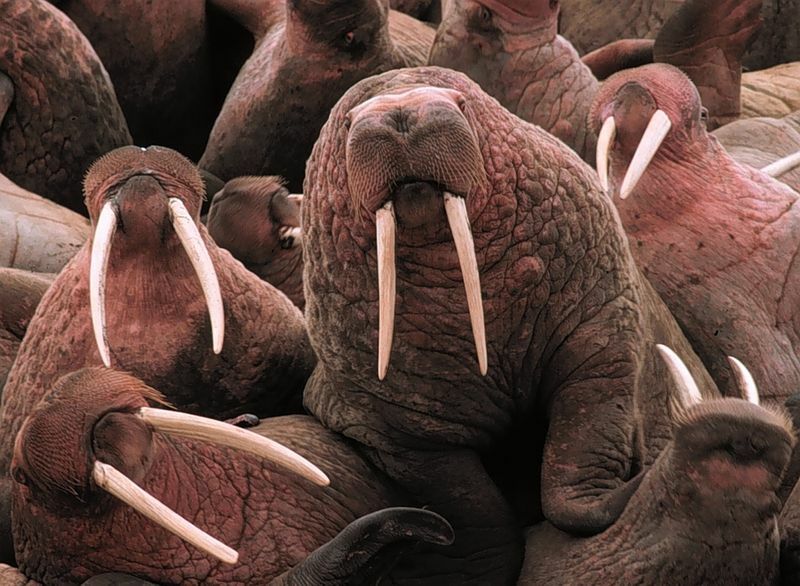 Walrus tusks are canine teeth that grow continuously throughout life. The Walrus is a unique-looking creature that inhabits the cold region of North Pole. The teeth of the Coruro are not quite unique for its yellow coloration because it’s just like a person who didn’t brush his/her teeth for 2 days or more. The animal’s teeth are bizarre because they are located outside its mouth. The Coruro is a rodent species native to Chile in South America. It has been found in a wide variety of habitats, from coastal to montane. Warthogs are odd-looking animals with bizarre teeth. Ansell's Mole Rat is a rodent species native to Zambia. It is weird-looking for its teeth that grow outside its mouth. Its teeth are use for eating and in digging. Babirusas are among the few animals with prolific and unique teeth. The male species has highly conspicuous tusks formed from the canine teeth.. The teeth of the Tiger Shark are oblique and serrated for sawing through flesh. It is one of the most dreaded shark species in the world. Another rodent species from South America with teeth that are located outside its mouth is the Stump-tailed Porcupine. This unique creature is found mainly in Colombia and in some occasion in Ecuador. Rabbits are born with permanent teeth. They shed their deciduous teeth before (or very shortly after) their birth. 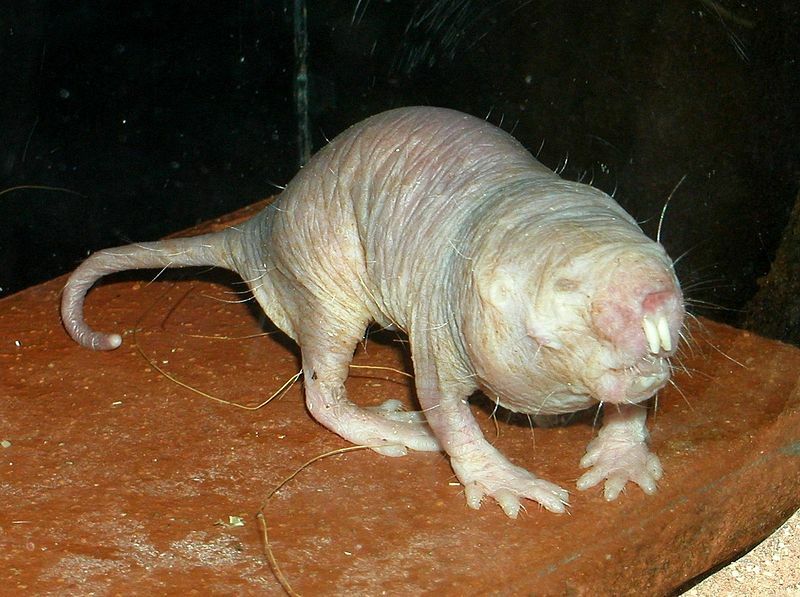 The blind Naked Mole Rat is one of the animals in the world with the toughest teeth. The teeth of naked Mole rat can penetrate a metal and cement wall. Like all other mole rats, its teeth are located outside its mouth. The teeth of reptiles are amazing. They are replaced constantly during their life. Juvenile crocodilians replace teeth with larger ones at a rate as high as 1 new tooth per socket every month. Once adult, tooth replacement rates can slow to two years and even longer. Over all, crocodilians may use 3,000 teeth from birth to death. New teeth are created within old teeth. The Damaraland Mole Rat and the Naked Mole Rat are similar in dental structure but they are different in appearance because the former is almost hairless while the latter is furry. The former and the latter are the only two known eusocial mammal. Guinea Pigs are not just cute but also unique because they have continually growing molars. A male Narwhal has up to 3 meter or 10 ft long tusk, an incisor tooth that projects from the left side of the upper jaw and forms a left-handed helix. The tusk can be up to 3 meters (9.8 ft) long and weigh up to 10 kilograms (22 lb). About one in 500 males has two tusks. There is a single recorded case of a female with dual tusks. The animal with the longest and largest teeth is the animal – the largest land-dwelling mammal in the world. The tusks, which are their second upper incisors can reach over 3 m or 10 ft in length and weigh over 90 kg or 200 lb.